This commentary originally appeared on Philly.com. 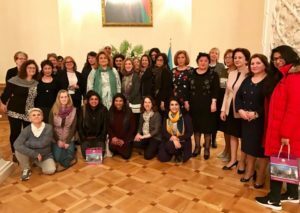 While the Republic of Azerbaijan had never been on my bucket list, I eagerly embraced the recent chance to experience it as a participant in a Muslim/Jewish women’s bridge-building trip helmed by the Sisterhood of Salaam Shalom® (SOSS). Azerbaijan’s unique and successful model of peaceful coexistence among people of different faiths and cultural backgrounds was the draw. Azerbaijan is situated in the South Caucasus region, at the crossroads of Southwest Asia and Southeastern Europe. It is bound by the Caspian Sea to the east, Russia to the north, Georgia to the northwest, Armenia to the west, and Iran to the south. The Azerbaijan Democratic Republic proclaimed its independence in 1918 and became the first democratic state in the Muslim world. The country was incorporated into the Soviet Union in 1920. The modern Republic of Azerbaijan proclaimed its independence in August, 1991, just before the official dissolution of the USSR in December of that year. 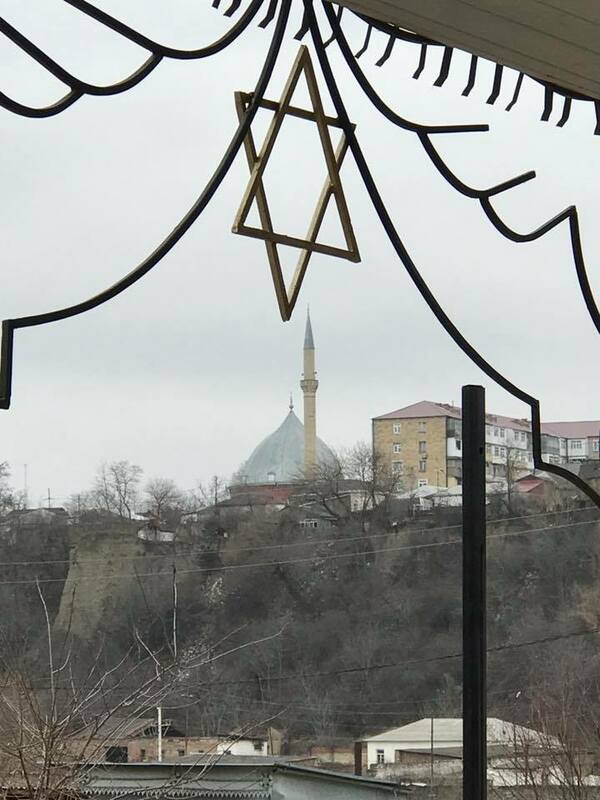 Over the centuries, Azerbaijan has shown the possibility of peaceful coexistence among diverse faith groups; Muslims and Jews, Shiites and Sunnis, all live together in peace, harmony, and dignity. We wanted to study how they do it. Multiculturalism leads to mutual collaboration and respect among the various components of society. It provides a source of vitality to the public and civil life of the country and propels its citizens to work cooperatively for the common good – which is what regional chapters of SOSS strive for as well. Our delegation attended Jummah prayers at mosques and Shabbat and Purim services at synagogues. Dignitaries we had the privilege of meeting included the U.S. ambassador to Azerbaijan; the chairwoman of the state committee for family and women; the chairman of the state committee on religion; the president of the Azerbaijan Diplomatic Academy, an English-speaking university that is both “green and smart”; and the deputy chair of the Caucasian Muslim Board — the only woman deputy in the Muslim world. We celebrated the festival of fire which proceeded the holiday of Nuruz — New Year’s — in the old city of Baku with a camel parade, flames of fire, balloons, sparklers, and a panoply of regional dances and music. 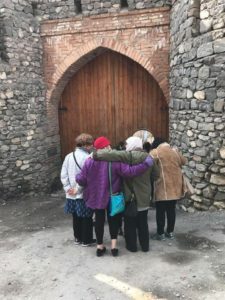 Our group of Jewish and Muslim American women toured the country’s urban and rural regions, and its cosmopolitan centers, and followed the silk route through the mountain communities of Sheki and Quba. We visited the Absheron Peninsula that has the oldest oil-producing fields in the region. We visited ancient ruins, including Sheki Khan’s palace, and saw centuries-old vineyards that support a thriving wine industry. And we payed homage to those Muslims and Jews who were part of Azeri history. We garnered the attention of the Azerbaijani public as we were interviewed and photographed for the press and TV stations. 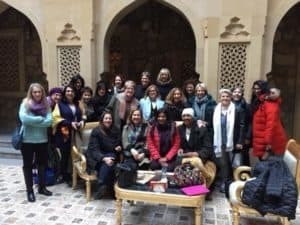 There was curiosity about our mission — Muslim and Jewish women traveling the country, praying, meeting with leaders, talking with government officials, and being feted as we shared our message about being sisters who were waging peace. At a time when Jewish cemeteries in the U.S. are being vandalized and Jewish community centers are receiving bomb threats, our Muslim sisters stand with us, and us with them on issues of Islamophobia. 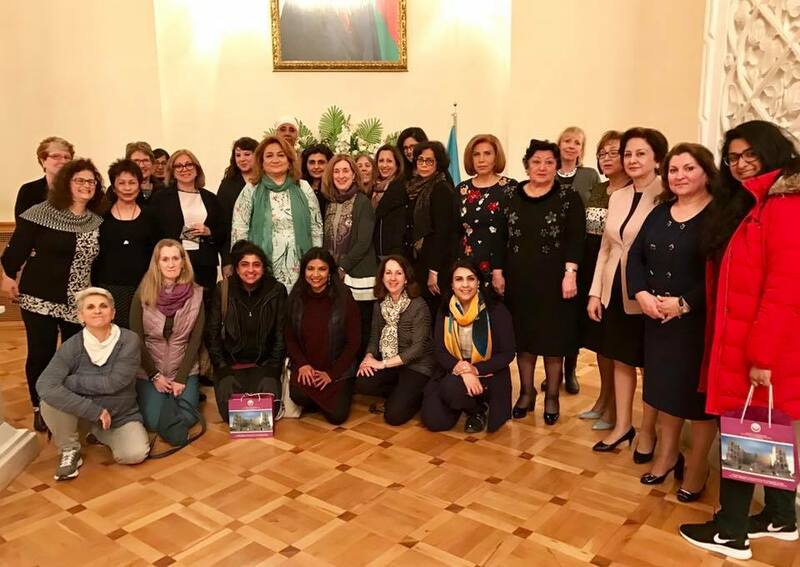 In our 10-day trip, we learned that the model of respecting differences and honoring diversity are strong practices and beliefs, held for generations, and the basis of forming deep friendships among Azerbaijani citizens. Pope Francis, on an official visit to Azerbaijan last fall, praised the country’s culture, harmony, and peaceful coexistence. So this is what we learned: Coexistence is alive and well and thriving as a model for us in Azerbaijan. Marcia Bronstein is regional director of the American Jewish Committee (AJC) Philadelphia. Reach her by email.